Don’t you think it’s really hard to come up with a clever, fun, fundraising event? Like the Accidental Locavore, you probably just show up at most of them to show support for whoever you know who ended up on the board, right? It was with that kind of initial reluctance that we gave up a recent Sunday afternoon to show our support to the Poughkeepsie Farm Project, our CSA. Earlier in the summer anyone who wanted could go make and decorate bowls for the lunch. 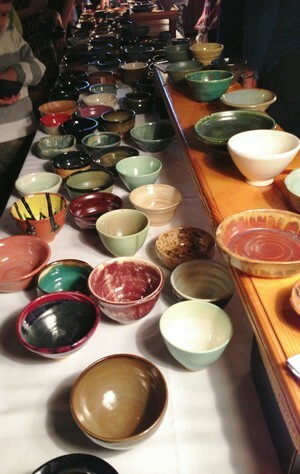 When we arrived, there were tables with hundreds of great-looking handmade bowls for you to choose from. Since we actually needed a couple of neutral bowls (come on, aren’t you sick of my shots from plain white bowls?) we were happy to find two lovely (almost) matching ones. To fill your bowl, you got your choice of soup from a number of local restaurants and if you couldn’t make up your mind, you could keep going back for different tastes. 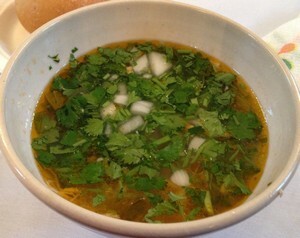 I started out with a Mexican chicken and lime soup with lots of cilantro. 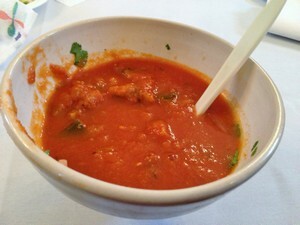 Frank had a Moroccan soup with tomatoes, cumin and chick peas along with a lot of other veggies. Both of them were really good. On our second run, he had a potato leek that was pretty good and I had the winner of the day, a smooth tomato soup with eggplant and zucchini that was just amazing! Unfortunately, I’ve totally forgotten which restaurant was responsible for such a delicious soup. And playing in the background, a folk trio, which prompted my husband to wonder why at farmer’s markets and other produce-related events, it’s always folk music. Not that I think a Miley Cyrus wanna-be would inspire me to eat more soup or buy more bok-choy, but why do you think it’s always something that immediately brings A Mighty Wind to mind? Music aside, it was a really fun event. Quick, casual, with good food – an interesting spin on your typical fundraiser. I’m looking forward to next year! Yes, I did make it to this year and it was even better than last! Looking forward to the Dragon Boat races and especially Asian food! Yes, I did make it to “next year”! And it was even better this year! Looking forward to the Dragon Boat Races and especially any Asian cuisine! And you did make it to “next year”! (I sat at the table with you and talked about the Dragon Boat race). What I didn’t mention was that at the same time the colorful Dragon Boats were racing with local participants, on shore there was an Asian Cultural Festival, coordinated by Arts MidHudson, which featured some Asian cuisine- so I will let you know about next year’s race, July 25th, and the FOOD.